Are you looking for a shampoo for cleansing and maintaining your curly hair? Curly hair require a lot of maintenance and can lose their shape if treated with harsh products that damage the curls and make them look dry and rough. Using a good shampoo to keep your curly hair clean can help you get defined curls more easily. Washing curly hair is an art and some simple tricks can help you maintain the shape of the curls more easily. There are very few shampoos available in the market that are designed keeping in mind the needs of curly hair. Formulated with a blend of nourishing Brazilian oils, the Bumble & Bumble curl care shampoo comes in a handy packaging with a flip-open cap. The main ingredients of the shampoo include Babassu oil, Pracaxi oil, Brazil nut oil, and nourishing seed butters to control the frizz. The texture of the shampoo is rich and it has a nutty scent. The shampoo is gentle on the hair and defines the curls without stripping away any moisture. The price of the shampoo is high. The shampoo is free of sulphates and uses nourishing oils and butters to condition the curls. It reduces frizz and adds a shine to the curls if used regularly. The shampoo has a pleasant smell and cleanses the hair thoroughly. The price of this shampoo is higher than other shampoos for curly hair. The shampoo can make the hair feel heavy if not rinsed properly. It is a very gentle shampoo that cleanses the hair well and uses hydrating butters to keep the curls in shape. It reduces frizz significantly and improves the texture of the hair if used regularly. With two sizes to choose from, this shampoo is designed for thick curly hair and is made using silk protein, neem oil, coconut extracts, and hibiscus extracts. It removes all impurities from the hair without stripping away the natural moisture and improves the texture of the hair. The shampoo has a creamy texture and coats the curls evenly. It rinses easily without leaving any residue in the hair and smells pleasant. The price of the shampoo is affordable. It contains coconut and neem extracts that have antibacterial properties and cleanse the hair well. The shampoo has a rich texture and adds a bounce to the curls. It lathers well and leaves the hair smelling fresh and clean. The shampoo makes the hair feel greasy if more quantity is used than required. You need to shake the shampoo bottle before each use to mix the two layers. This shampoo works on thick hair and gives them a natural shine while maintaining the curls. Silk protein helps to repair damaged hair and reduces hair loss and breakage too. Formulated for dry and curly unruly hair, this shampoo from Kerastase comes in two sizes and has a paraben-free formula. The shampoo comes in a standard bottle and has a nice scent that lingers in the hair. The formula is a bit thick and concentrated and coats the curls evenly. It cleanses the hair gently and does not leave any residue in the hair. The shampoo contains nourishing nut butters that condition the curls and maintain their shape even after a few days of washing. The price of the shampoo is very high. The shampoo is very nourishing and coats all the curls with a small quantity. It contains nut butters that condition the hair and enhance manageability. It works well on unruly and dry curly hair and has a pleasant scent. The packaging of the product is a bit bulky to handle in the shower. The price of this shampoo is very high. The Kerastase range is known for its professional results and this shampoo soothes unruly curls in just a few washes with its nourishing and rich formula. The price may seem a little high but a little quantity goes a long way. If you are looking for an affordable shampoo for curly hair, the Hairgurt yogurt shampoo is a good option to consider. It is available in three refreshing variants and comes in a very handy tube packaging. The formula contains a blend of six botanical oils, coconut, acai berry extracts, yogurt protein, quinoa, and prebiotics that repair the damaged hair and add a natural shine to the curls. It has a coconut fragrance and the quantity is great for the affordable price. Coconut and acai berry extracts with yogurt protein and natural oils nourish the hair from the root. The packaging is very handy and travel-friendly as well. The price of this shampoo is very affordable as compared to other shampoos. The shampoo can leave a bit of a residue on the scalp. It might take multiple washes to clean the curls and the scalp effectively. It is a very affordable face wash and is formulated with soothing ingredients that make the skin soft and radiant. The natural ingredients and paraben-free formula make it a very good choice for dry and sensitive skin. Specifically designed for African-American curly hair, this natural shampoo is infused with avocado oil and comes with a pH-balanced formula. The formula is quite hydrating and can be used for colour-treated hair also. It has an invigorating eucalyptus scent and creates a rich lather with just a few drops. It cleans the hair and the scalp well and is easy to rinse. The packaging is also quite convenient to handle and the price is affordable. Avocado and jojoba oils nourish the hair and repair dry and damaged hair. The shampoo is affordable and the quantity lasts well for 2-3 months. The formula is suitable for all types of curly hair from 3A to 4C. The formula is not very hydrating and will not be suitable for very dry hair. The shampoo has a strong fragrance that might irritate the scalp. Avocado oil works very well for curly hair and strengthens the hair from the root. The shampoo cleanses the hair well and comes at an affordable price. The packaging and the quantity are good as compared to other shampoos. If you are looking for a sulphate-free shampoo for curly hair, the L’Oreal Paris EverCurl shampoo has a non-drying formula that moisturizes the hair well. It is designed to reduce frizz and contains coconut oil which helps in cleansing the hair as well as maintaining the curls. 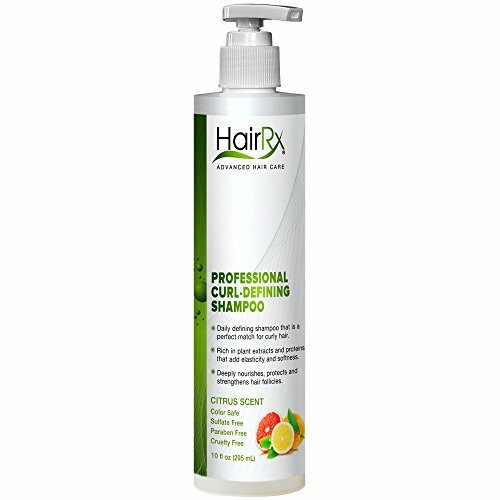 The formula claims to maintain the curls for up to 48 hours and does not weight down the hair. The price of the shampoo is reasonable and it is available in three size variants. It reduces frizz and maintains the curls without weighing the hair down. The shampoo is formulated without sulphates and contains no surfactants. It comes at a reasonable price and has multiple variants for different hair types. The shampoo is a bit mild for thick and unruly curls. It can cause product build-up in the scalp if not rinsed properly. This shampoo does not strip the natural moisture from the hair and works well for thin curly hair. It holds the curls for a few days and has a light and clean scent which does not irritate the user. A shampoo that gives professional results, the HairRx curl-defining shampoo has an advanced formula made up of plant extracts and proteins. It comes in a pump packaging and has a light citrus scent. The shampoo is available in ten variants and contains lemon, orange, melon and grapefruit extracts. It is formulated without sulphates and parabens and is suitable for all types of curly hair including coloured hair. The price of the shampoo is moderate. The shampoo contains nourishing proteins that define the curls and repair damaged hair. The formula is quite lightweight and has a fresh citrus scent. It does not contain any harsh chemicals and gives professional results. The shampoo can leave the hair a bit dry because of the citrus extracts. It is not as nourishing and rich in terms of texture. This is a good shampoo for people who have light curls and prefer fresh scents. It cleanses the hair very well and is formulated without sulphates and parabens which is an added advantage. Enriched with antioxidants, the Pantene curl perfection shampoo comes in a pack of four and is available in eight variants. It uses a frizz-calming complex that smoothens the curls and seals moisture in the hair. The shampoo removes dirt and oil from the hair and keeps the curls defined for a few days. Antioxidants help to reduce protein loss and add a natural shine to the hair. The price of the shampoo is quite affordable as compared to the quantity. It contains a frizz-calming complex that smoothens and conditions the hair. The shampoo is quite affordable as you get four bottles that last for 5-6 months. The formula contains antioxidants that protect the hair from further damage. The shampoo contains chemicals that can damage the hair if used often. It is not available in a single pack for trail purposes. It is a very affordable shampoo for daily use and redefines the curls with its hydrating formula. It cleans the hair well and does not feel heavy on the scalp. The antioxidants in the formula reduce breakage. Aveda is known for its salon-quality haircare products and this shampoo is specially designed to tame curly hair. It is available in two sizes and is formulated using wheat protein and aloe Vera. The formula is very gentle on the hair and has a light and refreshing fragrance as it contains pure plant extracts of lime, lemon, orange etc. Regular use helps to keep the curls in shape and reduces frizz by up to 57% percent. The price of the shampoo is higher than some other variants. Aloe Vera and wheat protein strengthen and hydrate the hair instantly. The shampoo offers two size variants and reduces frizz significantly. It cleanses the hair gently and has a pleasant citrus scent. The shampoo is expensive and the quantity does not justify the price. It is not very effective on thick curls or colour-treated hair. This shampoo from Aveda works really well for naturally curly hair and has a lightweight formula that reduces frizz and hair fall. It defines the curls and helps them hold their shape easily. 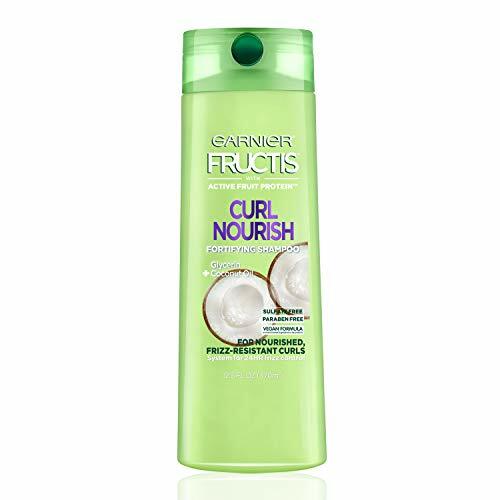 Made with jojoba, coconut, and macadamia nut oils, the Garnier Fructis curl nourish shampoo is great for people who live in areas with high humidity. It is available in three sizes and is designed to give a natural definition to the curls without weighing them down. The formula contains active fruit proteins and is free of parabens and sulphates. It is suitable for coloured hair also and comes at an affordable price as compared to the quantity. The natural oils clean and moisturize the hair without breaking the curls. It contains active fruit protein and protects the hair from heat-related damage. The shampoo is free of sulphates and parabens that can damage the hair. It contains some chemicals that might irritate sensitive scalps. The shampoo might feel a bit heavy if used on fine hair. The shampoo is good for medium to thick hair and contains natural oils that are very beneficial for the hair. These oils protect the curls from high humidity and define their shape. Do not wash curly hair very often as this can break the shape of the curls and can cause the hair to look dry. Wash your hair with plain water and conditioner between shampoo washes to keep them clean without drying them. Do not pile the curls on top of your scalp while cleaning them with a shampoo. Let them hang loose to let the shampoo coat all curls evenly. Brushing through the curls after applying the shampoo helps the formula in reaching all parts of the hair and maintaining the shape. Avoid buying shampoos that contain sulphates and parabens that dry out the hair and cause a lot of product build-up. Shampoo your hair in a back and forth motion to avoid the curls from tangling up. Washing them with a circular motion can cause the curls to lose their shape. Rinse the shampoo well from the hair and repeat rinse if necessary as curl shampoos can leave a residue in the hair if not rinsed properly. Nourish your hair with a good hair serum after wash to give a natural shine to the curls and reduce frizz. Go for shampoos that contain nut butters and oils as curly hair can be very dry and these shampoos hydrate the hair adequately. Use a very little quantity of shampoo and create a rich lather by mixing it with a little water. Using too much product can weigh down the hair and make the curls look out of shape. So this was the list of the ten best shampoos designed for keeping curly hair clean and in shape. These shampoos work well in holding the shape of the curls for all day long and are very gentle on the hair as well. Most of them are formulated without parabens and sulphates that dry out the hair if used excessively. Always choose a shampoo that is suitable for your hair type as curly hair also have many categories. These simple tricks will help you maintain your curly hair in the right condition without many efforts. Which is your favourite shampoo for curly hair? Is it good if I wash my curly hair in daily? I don’t suggest you to wash your hair in daily because it would make your hair too dry. If you want to refresh your hair, try co-washing your hair with water and conditioner. I want to know how often should I wash my curly hair? You can wash your curly hair more often as you wish. However, I suggest you at least once a week. It depends on your active. You shouldn’t forget to clean build up from your scalp as well. Bumble and Bumble Bb Curl Care Sulfate Free Shampoo is a good choice for curly hair like me.